There are some games you can’t help but adore, even if they are completely without merit. Revolution X is definitely one of those games. When the title released to arcades in 1994, Aerosmith’s Get A Grip album was just around a year old and with solid hits like Living on the Edge and a slew of videos featuring Alicia Silverstone (who was discovered by the band and started her career in these initial videos). 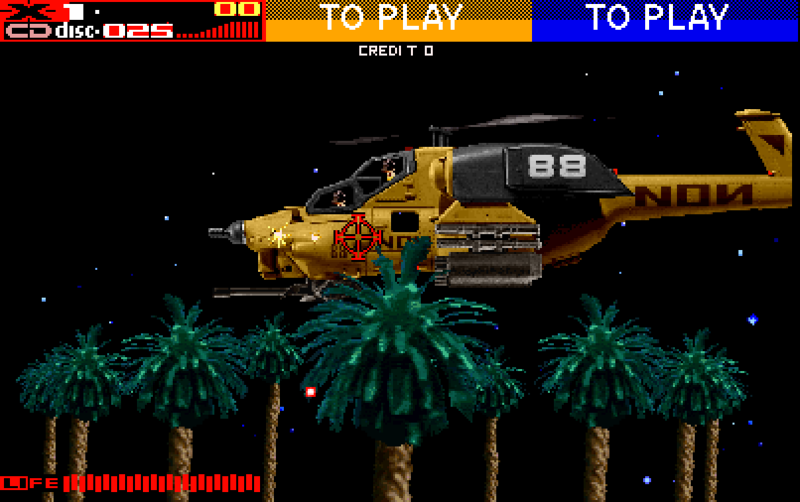 What originally started as a Jurassic Park game much in the same vein as previous title Terminator 2, Revolution X had to be retooled when Sega outbid Midway for the rights to Universal’s film. The result is a game with more off-the-wall and undeveloped ideas than a season of Lost that involves helping children around the world, saving the band, and stopping the New World Order and its leader Helga – a nazi-esque goth queen. Revolution X has a hell of an intro, but as we often see in games like this it’s only a matter of time until it all falls apart. Aerosmith is performing in some drab downtown Los Angeles club (Club X) and the New World Order shows up to kidnap the band. You start off shooting the endless supply of henchmen with CDs as your grenades and large blood spatters as you take out enemies. After all, this is the team that gave us Mortal Kombat. Before even entering the club you will face literally hundreds of enemies, large security bosses with shields and bulletproof armor, and a massive tank. Once inside you will blast away at (literally again) hundreds of NWO henchmen while destroying the intro lounge, complete with Kerri Hoskins (Sonya in MK3) as thonged dancers in cages, and eventually entire the massive main area where Aerosmith is jamming away to the song Eat the Rich. After a brief drop by the band’s dressing room and a visit from lead singer Steven Tyler, you’ll be tasked with attacking the NWO in various locations throughout the world, which also releases members of the band. Before that it’s one action-packed crazy escape from the club before eventually destroying an attack chopper and leveling the building while you’re at it. By now you should have spent approximately $10 or more in quarters because there’s no skill or chance in the world your health will last very long. This is why most people have fond memories of the game, because it was so insane to begin with you can’t imagine how things could go wrong. It does. There are out of control school buses, natives in grass skirts of Africa that would make anyone who criticized Resident Evil 5 cringe, and eventually an endless boss battle with Helga, who sits in a re-purposed version of the final boss of Smash TV. Not only was the game brought horribly to 16-bit consoles with graphics removed, sound and music (of all things) stripped, and violence toned down, but you didn’t get unlimited credits. This made an already lackluster title impossible to boot and ruined the experience of what was designed to waste credits and eat quarters. There wasn’t even a cheat code to get unlimited life or credits, just an eventual Game Genie code. In addition, the dancers from the arcade were flipped to be front facing – a fact no teenage boy at the time missed. Fortunately it was a bit of a different story on DOS and CD-based 32-bit consoles, violence was brought back in and all of the graphics, movies, and sounds were all re-integrated. Also there’s a Pro Action Replay code on the Saturn that gives unlimited credits and any import gamer will have one of these already for the purpose of playing those Japanese gems. 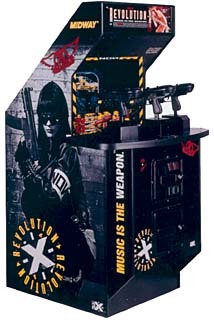 Revolution X was an example of the times and probably the last great light gun shooter from the concept that spawned with Operation Wolf. While I don’t have a great way to capture the game in arcade form, I have provided a video of the Saturn version in its entirety for your viewing pleasure. Enjoy.